Would you like a mage for a neighbour? The wizards who live here certainly do, there are no less than four traditional wizard's towers here, although one has fallen into ruin. The introductory notes provide a few ideas for using them 'as is' - or of course you can use them individually whenever you have need of a residence for a mage. It also provides a key to common items on the maps, and directions on how to operate the customisation tools to show or hide numbers, grid, furniture and heavy fill on the black and blue versions of each plan. First up, an overview of the valley, which has a Y-shaped river - the eddies suggest that the two branches entering from the bottom of the page join to flow off to the top-left, but that's up to you to decide. There are paths, woods, and bridges to enable the mages to visit each other without getting their feet wet or having to expend flying magic. Next is a round tower described as the Old Wizard Tower. This has three levels plus a cellar and a circular staircase. The ground floor has a kitchen and a living room, upstairs there's a comfortable bedroom for the mage and space for an apprentice on the top floor. There's a front view and a cross section to help you sort everything out. The notes describe the living area as the laboratory: well, it has bookcases and a large table with chairs... but also a couple of comfortable armchairs round a fire place. The second tower is called the Small Tower. It's basically squat and square with some unusual crenellations around its flat roof. Squat it may appear, but it still packs a ground floor and two upper levels as well as a cellar and that flat roof. Like the previous tower, the cellar is used for storage. The ground floor has a kitchen, dining room and bedroom; and there's a laboratory, a library, and a palour upstairs. The mage's comforts have been attended to, there is both a privy and a bathroom noted. Next the Large Wizard Tower is quite an impressive edifice. It has four levels plus a flat roof, and stands in its own grounds with a separate stable block and gazebo... and a full-blown dungeon underneath, complete with cells and a couple of laboratories. The ground floor contains the kitchens, library, a more public laboratory, dining room and storage. Upstairs, there is a master bedroom for the wizard and accommodation for several apprentices, who have yet another laboratory and a storeroom for components. The wizard has his own private laboratory at the top of the tower just under the roof as well. Finally, the Ruined Tower. In a considerable state of disrepair, you can still make out a ground floor, cellar and two upper levels. It was built to a round plan, tapering towards the top, and the remains of a spiral staircase can be seen. These are three nice towers that any mage might want to settle in, with ample room for study and experimentation. I'm not sure I want to know what goes on in the dungeon, though! 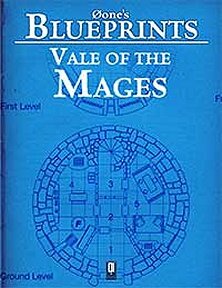 Return to Vale of the Mages page.